1. 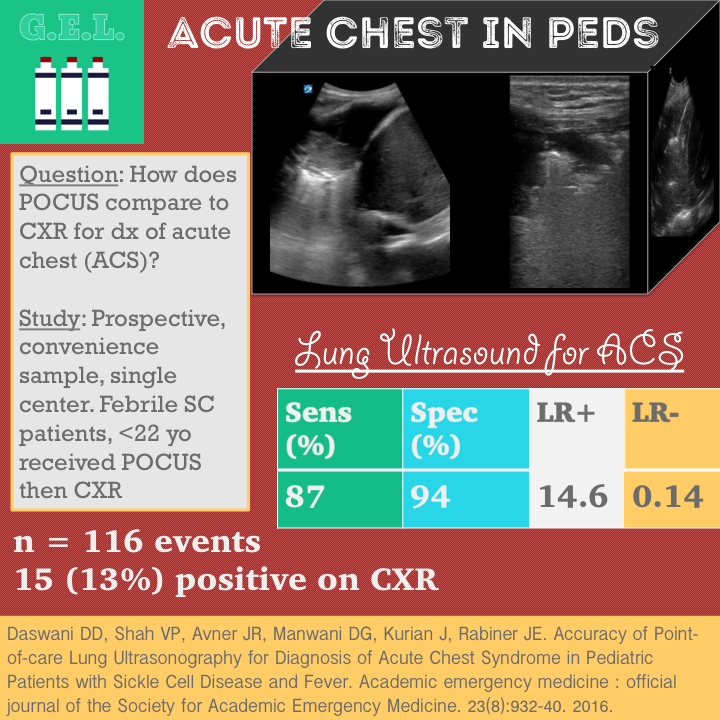 POCUS is 94% specific and 87% sensitive for acute chest syndrome in pediatric patients when compared to chest xray. 2. In certain circumstances, the combination of a high pretest probability and a positive lung ultrasound may be sufficient in ruling in acute chest syndrome. 3. In this study, operator experience significantly affected the accuracy of the ultrasound. Acute chest syndrome (ACS) is a major cause of mortality in sickle cell anemia disease (SCD). About one third of patients with SCD have it in their life time. 17% of sickle cell patients with fever will have ACS. Unfortunately, the physical exam lets us down again - half of these patients have no physical findings. The diagnosis is usually made by variations of this formula: history of sickle cell disease + symptoms consistent with acute chest syndrome + new infiltrate on chest xray = ACS. Obviously, this is not fool-proof but it is more or less how the initial diagnosis takes place. As a consequence, patients with SCD will have an average of 27 radiographic tests by age 18. Maybe there is another option without radiation? We already know that ultrasound is pretty good at diagnosing pneumonia in pediatrics (see our prior post and podcast here) and this is similarly a consolidative process so it seems like a reasonable idea. How accurate is point of care lung ultrasound in diagnosing ACS? diagnosis of ACS within previous 6 weeks (may have residual radiographic findings). Prior to imaging, history and exam findings were recorded. A PEM physician recorded likelihood of ACS into one of 6 categories of percentage of likelihood. Before cxr, point of care ultrasound was performed by a second PEM physician who was blinded to clinical info and physical exam (they did know it was a sickle cell patient with fever, and they could see the patient for any observable findings). Scanning for acute chest is the same as scanning for pneumonia - see the findings here! 3 patients who had no ACS on initial visit were diagnosed within 7 days (6 and 7 days later). This speaks to the accuracy of chest xray in making the diagnosis. 4 were operator error (spleen + air in stomach diagnosed as consolidation). 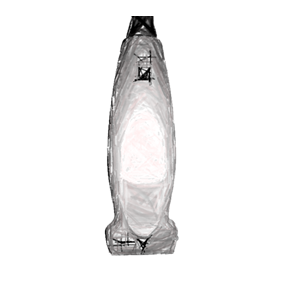 1 was also likely similar area (diagnosed in left lung base) but no clips saved. 1 was confirmed consolidation (missed by xray), treated as ACS on inpatient unit because of symptoms and respiratory distress. Broad range of operator accuracies (100% to 80% based on experience). This is likely more dramatic because of the small sample size, but is still concerning because whether it is a useful test or not depends on how good the sonologist is with ultrasound (so get better with ultrasound). 3. In this study, operator experience significantly affected the accuracy of the study.